One day I caught a few minutes of a TV panel discussing the presidential campaign (one can hardly avoid that!) They lamented that Donald Trump’s policy speech one night was overshadowed by the announcement of changes in his campaign team announced the next morning. . . . then they proceeded to focus on the “process” and completely ignored the policy! That got me to thinking about the priorities of election coverage, an issue I have addressed several times, particularly in relation to the use of poll results. See the links at the end of the article for several blogs about polling—it’s impact and an overview of understanding polling techniques—and some observations about bias. That leads me to suggest five elements, in a rough order of priority, that describe (and may well predict) the kind of coverage of the election we can expect —primarily from television and social media, but also in newspapers (especially on the first page or two of section one). Polling. Largely because of the 24-hour news cycle today, polling has become a required source of fresh “news” each day. While good polling is helpful in analyzing an election, the constant drip of daily poll information (often using questionable methodology) is, I think, not helpful in building an informed electorate. That in itself may be a pretty naïve supposition on my part! After all, who is really concerned about an informed electorate when campaigns focus so much on destroying the opposition. While polls are presented as though they are measuring the opinions of a well-informed population, that is far from the case. In reputable surveys by Gallup, Pew, and others, news consumption tends to be shallow at best. 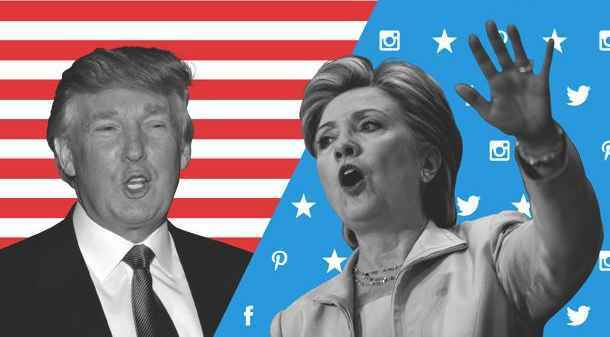 Unbelievable a few years ago, social media outlets have become the primary source of news among younger segments of the electorate. In addition, there have always been “chronic know-nothings,“ some who may honestly say they don’t know in response to a poll question, but others just as eager to put in their two cents! Pouncing. A reporter described how in a speech Hillary Clinton “pounced” on statements by Donald Trump, who is more likely to be said to “attack” Hillary, but I’ll stick with Pounce for the sake of alliteration. Everybody does it and it’s right up there with polling as the focus of stories. Whether you like it or not, attacking the position and especially the character of opponents is a well-honed tradition in American politics. I recently read David McCullough’s excellent biography of John Adams, which clearly demonstrates that the roots of the tactics seen today go all the way back to the founding (and throughout human political history before that!). While today we hear suggestions of news outlets favoring one party or the other, in Adam’s time the leading papers had clear allegiance to one party, with no pretense of objectivity. Problems. This is the external version of Pouncing. Events and circumstances outside the campaign itself may intrude on the campaign, or be used to characterize a candidate. In the background of Hillary Clinton’s campaign have been questions about her personal email server and, more recently, allegations of “pay to play” tying donations to the Clinton Foundation with gaining access to Hillary when she was Secretary of State. Nothing comparable has been attached to Donald Trump—he has often created his own problems with his untamed rhetoric and forceful personality. Process. The internal workings of most organizations would usually be considered pretty boring...unless it involves internal strife and tension. Changes that can be interpreted as reactions to a bad or weak position can be interpreted as trouble in the camp. These stories fall behind Pouncing and Problems in my priorities simply because they are typically more sporadic than the former, unless a campaign has fallen into disarray or lost the ability to contain internal disputes. The example mentioned earlier is apropos. When given the chance to look with more detail at a policy speech, the “process” of changes in Trump’s campaign team took all the oxygen and became the story of the day. The same thing could have happened to Hillary. Policy is tough to deal with, so almost anything else is easier to report and assumed to be more appealing to the audience. Once again, however, I contend that making that assumption does a disservice to the voters. Policy. Speeches and materials on policy issues do not get much coverage. They are typically seen as not exciting enough for the headlines, even if they represent actions that could have a profound effect on people, or need to be subjected to a reality check. Policy takes time (or space) to explain and requires knowledgeable and competent journalists to research and report. Covering a policy speech may lead to fact-checking, which can vary widely in helpfulness. Watching the headlines on the Comcast home page recently, there was a dramatic difference between fact-checking of a speech by each candidate. After Donald Trump gave an economic speech, Comcast used a video featuring an interview with one expert who disagreed with Trump on several fronts. Not much different from finding an expert witness to support or shoot down evidence in a trial. After Hillary Clinton gave a similar speech, Comcast used an AP print report that did a pretty fair job of examining specific claims in the speech. Interestingly, however, the majority of Clinton’s speech consisted of attacks on Trump’s ideas, so the fact-checking actually was one step removed—essentially fact-checking Hillary’s claims about Trump rather than her own policy positions. Not listed as a priority, but important nonetheless, is the role of pundits (to maintain the alliteration!). While a “straight” report can be biased, pundits often are selected precisely because of their bias. They enter the picture at every level, some as hosts/commentators, others as proponents for one or both candidates. To provide a “balanced” view, we typically hear from hardliners from both camps, too often ending in shouting matches over polar opposite viewpoints. Once again, conflict and energy is more important than substance. In a mystery novel I read recently, the investigation of one crime leads the main character to a retired professor who has written the supposedly definitive history of an incident about which there has been much conflict. When asked about his work, which attempts to correct the popular “myth” about the event, the professor rhetorically asks whether the job of a historian is to illuminate or condemn. It seems to me that as far as election coverage is concerned we could use a lot more illumination. Often, more important to public perception of the actual story, whether print or video, is the headline attached to it. Many more people will see a headline (and any picture associated with it) than expose themselves to the story. Since the week of the Republican convention, I have been randomly checking the headlines on Xfinity’s (Comcast) home page to see what kind of coverage each candidate is getting. Next week, I will compare those stories to the priorities suggested in this post.